I have worked in Fisheries all of my life and started 6X Outfitters in 1979. Montana’s spring creeks are simply some of the best flyfishing in the world. Want to learn about flyfishing? This is the place. Sheltered, easy to wade, with a nice mix of riffles , pools and flat water. Explore the life cycle of the midge, caddis and mayfly. Learn how to read water, fish different parts of a stream and use the wind to your advantage. Your day will be a learning experience for the novice and a challenge for the expert. You will acquire more practical fishing knowledge on a wade trip with a guide than in any flyfishing school. My BBQ lunches set the standards. I am a licensed Outfitter, guide, insured and have Red Cross First Aid and CPR certification. Please join me for an angling experience on the most beautiful and productive water in the country. A 1-mile long spring creek that originates on the O’Hair Ranch in Paradise Valley south of Livingston. Mostly riffle water that is easy to wade. Open year round and only affected by runoff when the Yellowstone River floods. There is a 12-rod limit. This 3 1/2-mile long spring creek is actually the lower reaches of Armstrong Spring Creek that passes through the DePuy Ranch. All types of water from shallow riffles to deep ponds. Open year-round and only affected by runoff when the Yellowstone River floods. There is a 16-rod limit. A 1-mile long spring creek on the Nelson Ranch south of Livingston in Paradise Valley. Shallow, slow and easy to wade Nelsons has always had the most reliable hatches and is the best creek to sight fish. There is a 6-rod limit. I have access to many private lakes that range in size from 1 to 50 acres. Most have large rainbows that average 2 lbs. with fish up to 10 lbs. The largest trout are taken in April just after ice-out. The callibaetis and damsel fly hatch in May through August can be sensational. We may wade, float tube or fish from a drift boat. Lakes offer an excellent opportunity to sight fish to large trout. I float this famous Blue Ribbon Stream in a 15″ McKenzie-style drift boat. My Larvro Professional Flyfishing Dory has comfortable swivel bucket seats and plenty of dry storage for your gear. The float includes all transportation, lunch and beverages. The river is public water and is open year-round. I do most of my float trips in April, May, July and August. I require a 50% deposit for each day booked. Payment may be cash, personal check or travelers check. Sorry, no credit cards accepted. Please give 180 days notice on cancellations. “Al Gadoury is the finest trout fisherman I have ever known. His expertise in Montana’s spring creeks was enough to overcome my saltwater habits and was the only reason I ever caught anything out there.” -Pat Ford, photographer, author, The Best Fly Fishing Trips Money Can Buy. “Some of my best Montana memories are of fishing trips with Al Gadoury. He is a phenomenal guide–and also a helluva good cook.” – Carl Hiaasen, Writer. “I have seen hundreds of guides that claim to be experts on the Paradise Valley Spring Creeks… few that can back up that claim. Al Gadoury is one of the finest guides in Montana. An Excellent guide if you are a beginning fly fisher or even if you consider yourself an expert.” -Buzz Basini, Owner Spring Creek Specialist Fly Shop. “I have had the pleasure of working with Al Gadoury’s 6X Outfitters since 1990. Over the years I have learned not all fishing Guides are ‘created equal’ when it comes to the complexities of fishing spring creeks. Al Gadoury is one of the best I have ever seen.” -Steve Bielenburg, Stream Keeper, McCoy Spring Creeks. “Al Gadoury of 6X Outfitters is the best spring creek guide with whom I’ve ever had the pleasure of fishing and working. 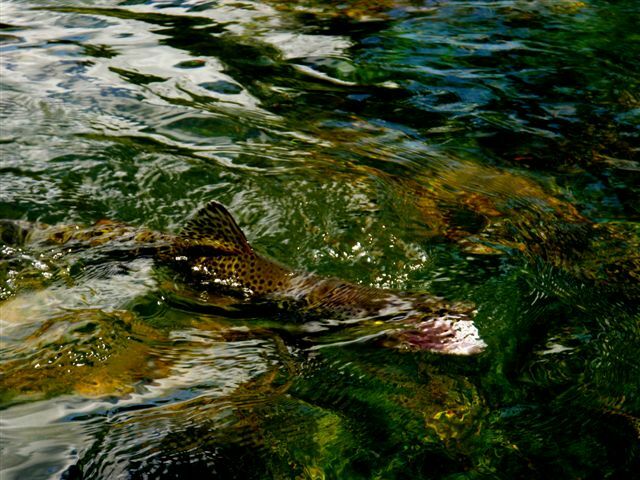 He knows the creeks, their hatches, particulars and ties magnificent flies.” -Dale C. Spartas, Photographer, Writer. “Al, our days together were fun, educational and the highlight of my fly fishing career. I am a better fisherman for having fished with you.” -Jim Lennox, Head Soccer Coach, Hartwick College, NY. “In over 45 years of fishing all around the world we have never met a more skilled, attentive, personable guide who is eager to teach and impart his knowledge to others.” – Leonard Baum, Chappaqua, NY. “Al Gadoury is an honest, hardworking and knowledgeable, with a wry sense of humor and a lifelong immersion in his favorite sport.” – Jim Vincent, writer, photographer. “Al Gadoury has been booking with us since we first got started and is one of the very best guides and spring creek fishermen in the business.” – Helen & Edwin Nelson, owners of Nelson’s Spring Creek.